The Gold of Lapland, is a brewery with almost 150 years of brewing tradition in the town of Tornio. 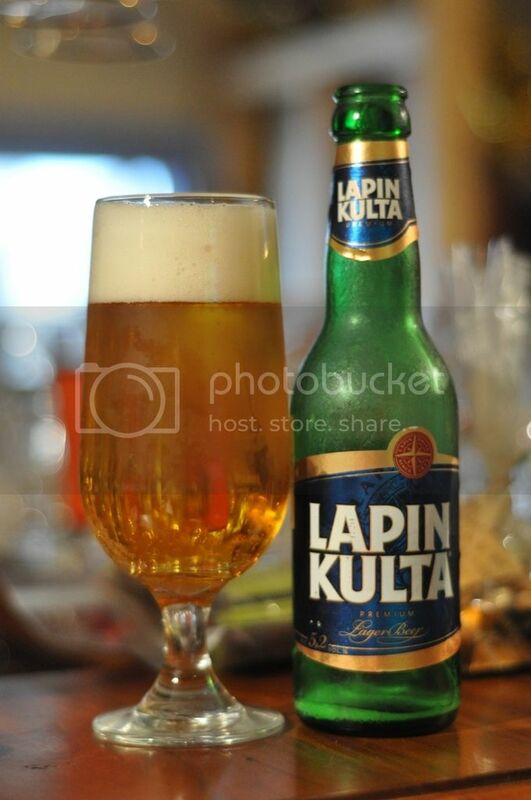 However due to Finnish regulations it was not until 1963 when the brewery acquired a gold mining company with the same name, that the name Lapin Kulta was adopted. To this day the companies line of business is listed as "prospecting for gold and the manufacture and sales of beer". Recently the brewery was bought by Hartwall, a Finnish soft drink and beer maker, who have moved the brewery out of Lapland. Coincidentally Hartwall are the brewery in Finland which brews Foster's under license. The beer I am sampling is the Premium Lager from Lapin Kulta, after a further recent takeover the brewery is now owned by Heineken meaning that this should hopefully make a good beer. The beer has a dark golden hue with lots of carbonation rising to a larger than usual head. The head is an unusual colour for a Euro Pale Lager, with an almost cream-like appearance. There does appear to be quite a bit of air in this head, which gives it that excellent lager look. Sensational looking beer, I would say appearance wise this beer looks better than a Heineken. On the nose there are big flavours of sweet malts and bitter hops. Most of the malts present appear to be of the bready variety as there is only a small hint of fruity sweetness towards the end of the nose. There are also grassy hops, which appear to be quite bitter. I am going to assume they are a Finnish variety as I can't pick it. The beer smells very refreshing and has a nice dry feel, I'm very interested to find out how this tastes, it's got all the elements so far of a great beer. The flavour doesn't let down the excellent lead up work, it's a really tasty Euro Pale Lager! The taste really follows the nose on this one, quite big sweet malts upfront before a mild fruitiness comes through. The hops are mild to strong and have a grassy feel to them, they are quite bitter and for mine really make this beer. It's quite a dry beer and is incredibly refreshing! This is close to the best Euro Pale Lager I've ever had! This is a really excellent lager. The beer looks great, smells great and tastes sensational! What more could you want? It would also make an excellent session beer, as the drinkability is very high. The overall feel of the beer is quite light in the mouth without compromising on flavour at all, and when you couple that with the amazing lacing this beer generates, you can see the quality that this beer is produced with. I can see this becoming a fridge regular in the not to distant future! If you are going to try just one beer from this challenge make it this one, it's brilliant!